Originally created as the Vancouver Grizzlies, the Memphis Grizzlies play in the National Basketball Association as part of the league’s Western Conference Southwest Division. The team is owned by Robert Pera and plays its home games at the FedExForum. Even though the team has yet to win a major championship, fans are excited to come back in the 2018-2019 season. During the last season, the team finished , 22-60 ending up in last place in the Southwest Division, and 14th in the Western Conference. It was clear their effort in the regular season would not qualify them for the playoffs. But this season, under the talented new head coach, David Fizdale, the Grizzlies are locked and loaded and are ready to make their presence known in a highly competitive Western Conference. Led by a gritty lock down defense, Memphis looks poised to reign atop of the Southwest Division.Division rivals, the San Antonio Spurs and the New Orleans Pelicans will fight to keep the Grizzlies down. Grab your Memphis Grizzlies tickets and head down to the FedEx Forum to be a part of your team's home court advantage. Since its inception in 1995, the Memphis Grizzlies have seen quite a lot of memorable moments. The First Winning Season: It was with the optimal use of talent, coaching and brains that got Memphis the 2003-2004 season victory – making it their first winning season in the history of the franchise. They managed to improve 22 games to arrive at a 50-32 record, which still remains as the best regular season record by any Grizzly team. Thanks to this winning season, Coach Hubie Brown won the 2004 NBA Coach of the Year Award while Jerry West landed the 2004 NBA Executive of the Year – the first and the only such award for the franchise. To top it all off, the fans got a winning moment they are not likely to forget any time soon! Mario Chalmers’ Game Winner: In a game on the 14th of January, 2016, against the Detroit Pistons, Mario Chalmers gave the Memphis Grizzlies’ fans a moment to remember for all times to come. It was during this game that the previously resented Chalmers managed to gain the respect of the people of Memphis. He hit one of the most clutch shots ever, over Derrick Rose and then hit the game winner at nearly the exact same spot, sending the crowd roaring with excitement. Taking place at the FedExForum, the game was won by the Grizzlies 103-101. Whether it is the brutal recurring playoff games or the bad blood between individual players, the Grizzlies are known to have some of the most intense rivalries in the NBA. San Antonio Spurs: The biggest rivals of the Grizzlies are without doubt, the San Antonio Spurs. It was in 2004, when the third-seeded Spurs swept the sixth-seeded Grizzlies and helped formulate what would become a highly intense rivalry. In 2011, the Grizzlies came back into the playoffs, as the confident eight seed. With Manu Ginobili of the Spurs injured, the Grizzlies sailed right through the series, winning three of the first four games as it took the series home. But in 2013, the tables were turned. As the two teams met in the 2013 Western Conference Finals, the Grizzlies suffered blowout losses in both Game 1 and Game 2 and by Game 3, it was clear that the series was out of their hands. This back and forth between the two teams has kept the rivalry alive and blazing. Los Angeles Clippers: This rivalry has grown out of the two first-round playoff meetings between these two teams in 2012 and 2013. In 2012, the Clippers won an exciting Game 7 in Memphis, while in 2012, the Grizzlies beat the Clippers in six games, always keeping the fans excited and enticed! Even though the Memphis Grizzlies have been around for a short period of time, they have had quite a few impressive players on their roster. Zach Randolph very quickly managed to become the best player in the Grizzlies history. His two best years were the 2009-10 and the 2010-11 season, where he led his team in terms of scoring average and rebounds in each game. He has been the best rebounder that the Grizzlies have ever seen, with an impressive 11.3 rebounds per game. In addition to Randolph, another great player is Marc Gasol. He is a solid rebounder, great shooter, keen passer and a very sturdy defender. He has gotten the Defensive Player of the Year Award and ranks fourth in terms of rebounds per game. To add to this, he also leads the Grizzlies in field-goal percentage with 52%. No list of Memphis greats is complete without the mention of Pau Gasol. He is credited with having led the team in scoring and rebounding six and five times and also led the team in blocks a total of five times. With such a great history and talented players under its name, the Memphis Grizzlies are all set to make an enthusiastic return to the field. And you will not want to miss it! The preseason games are kicking off early October with regular season games starting in October 2018. Grab your Memphis Grizzlies playoff tickets now and head on over to the FedExForum to get a basketball experience unlike any other! The FedEx Forum is unique due to its Memphis Music theme. Throughout the arena, guests can admire images of original art featuring regional artists whose work interprets music of the region. The most authentic element of FedEx Forum Memphis Music theme is the fact that the Smithsonian's Rock Soul Museum is located on the arena grounds. That combined with the Rock? Soul Museum also makes a unique game day experience, pre or post game. Our process for purchasing cheap Memphis Grizzlies tickets is simple and fast. There are so many online ticketing sites, that it can be hard for customers to find the right place to buy Memphis Grizzlies tickets at the cheapest price. At ScoreBig we think of our customers first and foremost. We offer daily deals for Memphis Grizzlies events, so our customers can get the best seats for the best prices. ScoreBig will always go above and beyond to offer the cheapest Memphis Grizzlies tickets on the market. The Memphis Grizzlies schedule above, displays all available events for 2019 and 2020. Once you find the event that you would like to go to, click the red “Get Tickets” button. It is located on the right-hand side of the event listing, it will take you to an Memphis Grizzlies event ticket page. ScoreBig's event ticket page will display all available Memphis Grizzlies tickets for that event. 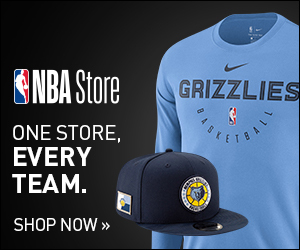 On the event ticket page to help with your search for the right Memphis Grizzlies tickets, use the filters at the top to select quantity, price range, and more. There is also an interactive seating chart so you can pick where you want to sit. When you are ready to buy a ticket, click on the listing, and you will be directed to ScoreBig's checkout page. Upon completion of the information fields, your order will be processed and your Memphis Grizzlies tickets will be delivered via email, mail, or to your mobile device. What makes ScoreBig’s site stand out from the rest? We are constantly analyzing our competitors to improve our site, service, and prices. ScoreBig.com employees strive to offer the best process and experience to buy cheap Memphis Grizzlies tickets. Our goal is to get you the best seats to Memphis Grizzlies events. We offer daily discounts on our site and for special promotions check out our newsletter. If there are no Memphis Grizzlies events currently available, you can use our search feature at the top of the page to see a list of all popular events going on near you. No matter your price point, we have all the best deals and discounts on Memphis Grizzlies tickets. For more information on prices of Memphis Grizzlies tickets and the schedule for Memphis Grizzlies, check out our listings above. The last thing you want to find out is when the Memphis Grizzlies event you wanted to go to is sold-out. Don’t worry in many cases ScoreBig has affordable tickets to sold out events. We sell tickets from GA all the way to premium seating and parking. Skip the scalpers in the parking lot and get your tickets online from top Memphis Grizzlies ticket brokers. We get you in all events, buy your Memphis Grizzlies tickets here from a brand that many trust and rely on for all their ticketing needs. ScoreBig offers a 100% money-back guarantee. If you have been in search of cheap tickets for Memphis Grizzlies, ScoreBig by far is the best option. That’s why ScoreBig has more loyal customers than any other ticketing site. Shop at ScoreBig for safe and secure Memphis Grizzlies event tickets.